This site is home to some personal interests - primarily photography at this time in form of "The White Creek Gallery". The rebuilt (2016) version featuring new material, better navigation and more up-to-date appearance but still missing some things to be ported from the legacy version as time permits. You will find some place-holders - primarily unsatisfied links - and other editing artifacts which will gradually be implemented or removed. You can choose either version for now from the menu to the left. 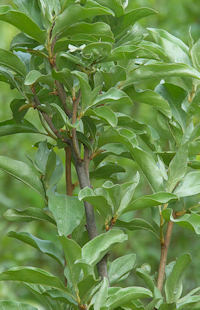 The Wolfwillow itself is a native aromatic shrub with silvery green leaves. It is well-known to everyone living in the western plains but especially prominent in the foothills of the Rocky Mountains here in Alberta.